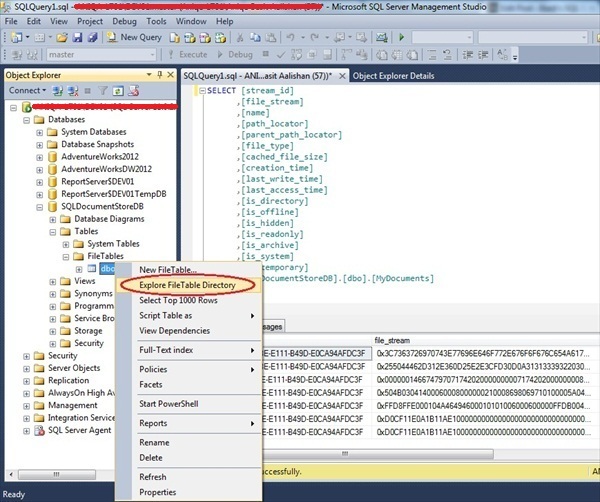 In this tip we will take a look at how to use FileTable feature of SQL Server 2012. 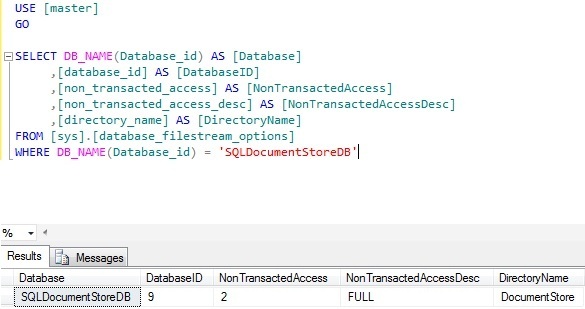 Note: 0 in value_in_use column indicates that FILESTREAM support s disabled for that instance, 1 indicates that FILESTREAM is available for Transact-SQL access and 2 indicates that the FILESTREAM access is enabled both for Transact SQL access and Win32 streaming access. 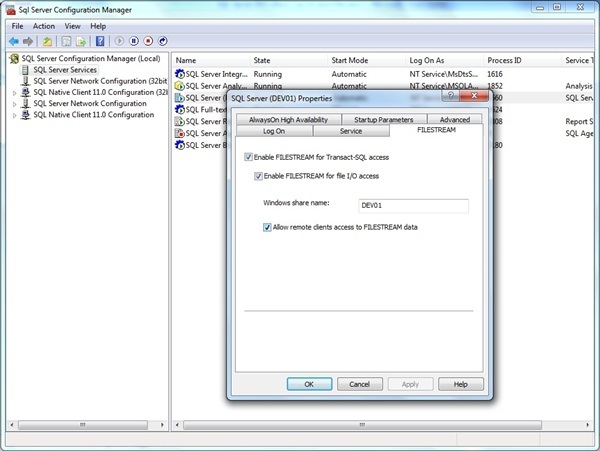 Click Execute and then restart the SQL Server service. This will disable all system-defined constraints and Win32 access to FileTable. This is useful when doing bulk-loading or re-organization of your data. DML\DDL triggers are supported on FileTable but DML trigger on a FileTable cannot update any FileTables. Normal Insert/Update/Delete are allowed for the FileTable manipulation. GetFileNamespacePath()–UNC path for a file/directory. 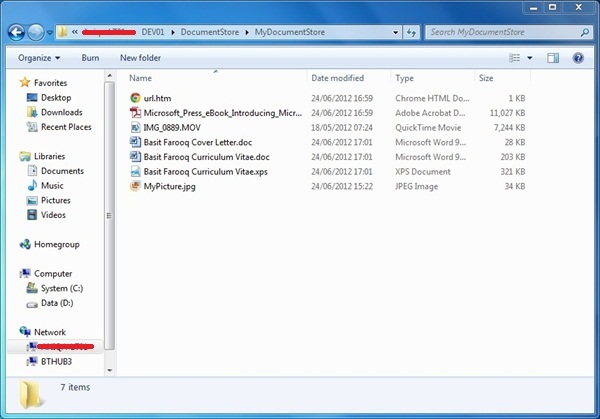 GetPathlocator()–path_locator value for a file/directory. FileTable can be dropped similar to any other table. Database Backup/Restore operations include FileTable data. Point in time Restore may contain more recent FILESTREAM data due to non-transactional updates during backups. FileTables are secured similar to any other user tables. Also same security is enforced for Win32 access. 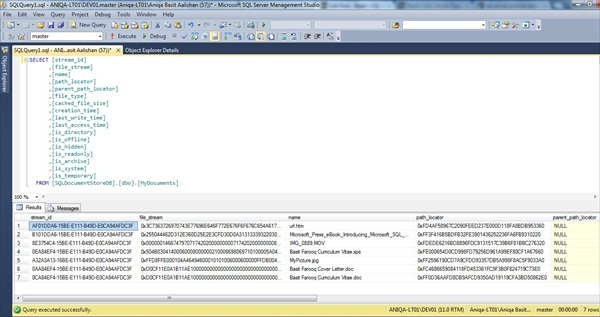 Windows tools like xcopy/robocopy OR drag-drop operations through WindowsExplorer can be used BCP operations are supported for direct T-SQL data inserts. 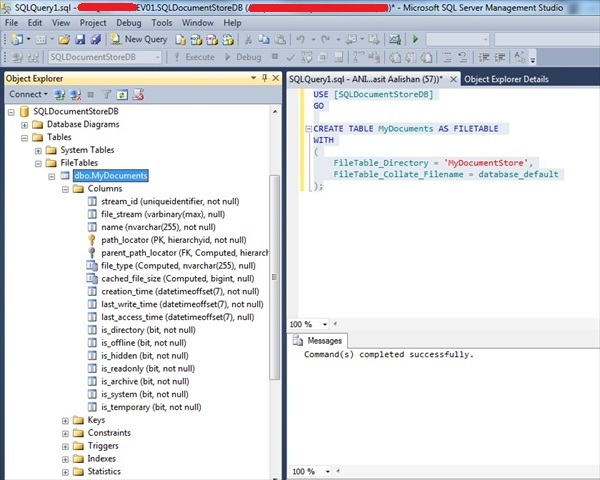 FileTable is a cool feature of SQL Server 2012 that allows applications or users to store files/directories inside database. 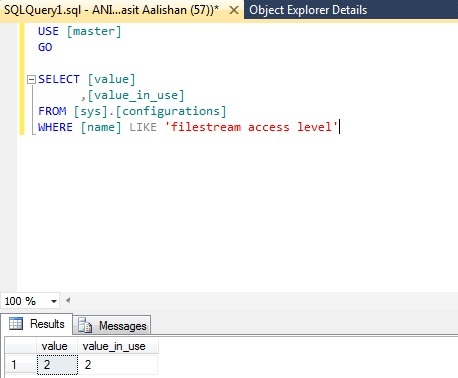 This feature is built on of SQL Server FILESTREAM technology and is very simple to use.